This is hand-knotted rug which is woven at handloom by our expert weavers. 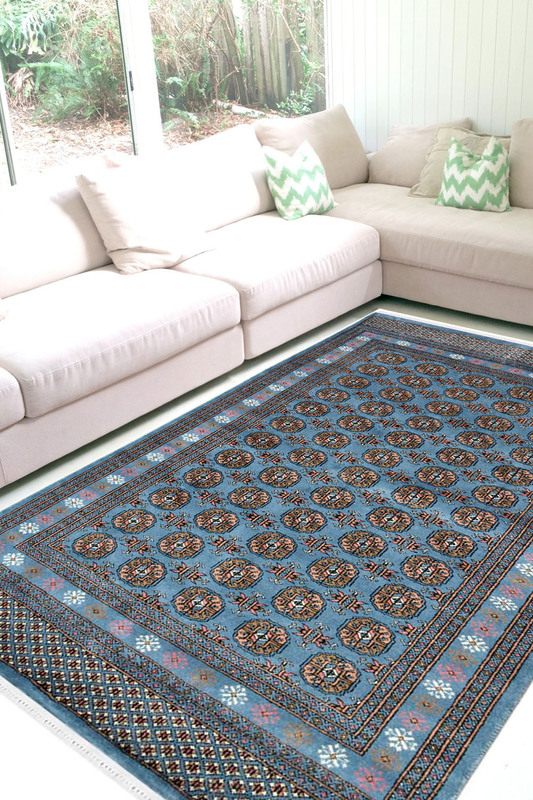 This sky Bukhara carpet is made of pure New Zealand wool. This is suitable for the dining room. - This carpet has extremely tiny patterns with very smooth color. - It has taken about 7-8 months to weave. - It has circle design in center with small motifs. - Sky Bukhara is one of the designer carpets in rugs and beyond collection. - Due to its size, this is absolutely fit in medium size space. - It can convert your simple room into the traditional and attractive look. - The main color is sky blue. Bukhara design is originated from the city of Bukhara. - This design is very popular. - This totally hands washable rug and hs very high durability.